Each child is unique.If your child shows these signs, he or she might be ready to start piano lessons! INTEREST Does your child show interest in the piano by approaching the instrument to explore and to play on it. Does your child show high interest in music and instruments? Independently singing songs or trying other instruments such as the guitar or string instruments can be a strong indication of interest. It is important that your child has a curiosity and interest in piano. The student should WANT to take lessons. FOCUS Will your child be able to sit at the piano for the majority of a half hour lesson? A typical lesson at Mooresville Arts includes a variety of activities, from warmups to song practice. If your child has a hard time staying focused for a half hour, it might be best to hold off on lessons till they can maintain their focus for longer periods of time. READING ABILITY While a set age does not determine readiness, students must have some level of independent reading. Piano method books often assume that the child can read at least some of the directions. If your child cannot read, then you will need to sit with them as they practice to guide their at home practices. PRACTICE Is your child willing to work? Consistent practice is the most important element to your child’s success. 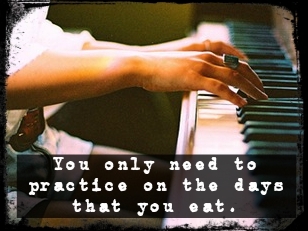 Piano students must practice and while much of the material they will play is “fun,” practicing is hard work. Ask your child if they are prepared to go to the piano at least 5 days a week and spend 15-30 minutes practicing. If the answer to that questions is no, then they are not ready for lessons. Only so much can be accomplished in even the most productive of lessons. Continued at home practice helps a student progress more quickly and maintain growth in their piano abilities. A student does not need to own a piano, a decent keyboard is pretty affordable these days and a great option for practice. Our in studio pianos may also be requested for practice time during classtime hours, if not in use. With any performance art, practice is a vital key to improvement. Piano lessons strengthen a students ability to focus and grow in other disciplines. Determination to practice has many rewards. For more information on available piano lessons, contact mooresvillearts@gmail.com or call 317-437-0102.